A proper dog fence will be strong enough to contain large dogs. But, it must also have a mesh design tight enough to stop little dogs from escaping. 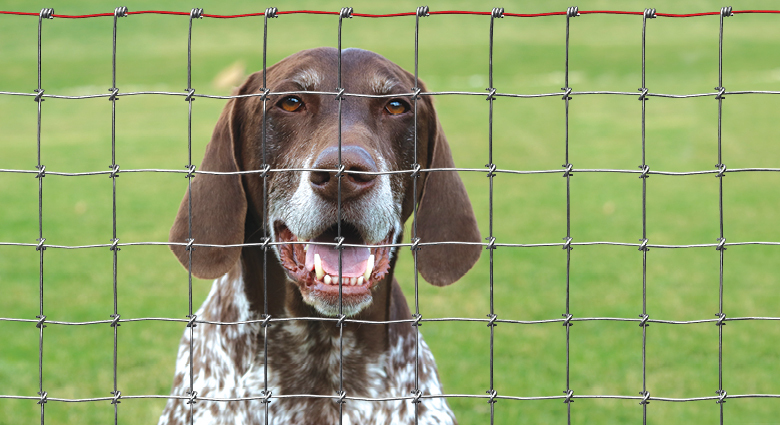 Red Brand’s Yard, Garden & Kennel (YG&K) fence is the best of both worlds. Built with all types of dogs in mind, Yard, Garden & Kennel has a variety of features that make it a valuable resource for any property. Yard, Garden & Kennel fence was inspired by the design of our Non-Climb Horse Fence. Both fence types utilize Red Brand’s patented Square Deal Knot. It’s a unique solution, as it provides a strong, but flexible connection between the horizontal and vertical wires of the fence. The knot allows the fence to flex on impact, and then spring back into position. The knots stay tight to the wires, preventing unintended openings in the mesh. In contrast, kennels made of welded wire don’t have the security of knots. Pressure from leaning or pushing oftentimes results in broken welds and holes in the fence. Read more about Red Brand’s fence knots here. The Square Deal knot is a good start, but a fence is only as strong as its material. Yard, Garden & Kennel is made from sturdy American-made 16-gauge wire. It’s strong enough to withstand testing from even the largest breeds of dogs. Small dogs will also be safely contained, as every roll of Yard, Garden & Kennel is constructed with a 2” x 2” mesh pattern. Even most puppies would have a hard time fitting through the two-inch spacing. Chain link fencing is costly, awkward to install, and can be difficult to maintain. In contrast, Yard, Garden & Kennel is an affordable and attractive alternative. It’s lightweight and easy to unroll, making it much simpler to install. An added benefit is that all Red Brand fence is galvanized with a coat of zinc that resists rust. So, your fence will look nice and last a long time. Beyond safely containing dogs, Yard, Garden & Kennel is a valuable, multi-use product for any farm. The tight two-inch mesh is great for keeping small pests like rabbits out of your garden. And, horse owners know how dangerous it is for dogs to run into the arena while riding. Try lining the outside of your arena with a short strip of Yard, Garden & Kennel to discourage unwelcome participants during your rides. For these uses, Red Brand offers a 36-inch high roll of YG&K. While that’s far too short to be used for a kennel, it’s a great option for a variety of small fence projects around your property. To find the right Yard, Garden & Kennel product for your needs, talk to your local Red Brand dealer. You can locate one near you. It’s also available at our online store.